Ever since I stumbled across Far From Home Cafe food truck (“your favorite comfort foods from all around the world”) I knew I had to check it out. I love comfort food! I was intrigued by the menu containing a variety of burgers, tacos and enchiladas. Hmm…this could either be very good or very, very bad. Unfortunately, my work schedule does not often allow a long, leisurely lunch hour and I never knew where the truck would be. Lucky for me, Far From Home Cafe has a new home, along with Guapos Tacos and a variety of cupcake trucks. Also lucky for me was the fact that my co-worker was in possession of a car for the day (most of us bike or take Septa.) Because it was a busy birthday week, we had taken my co-worker to a Thai lunch the previous day and opted to check out the truck on Friday. As we headed out, I tweeted out that we were heading over for some birthday lunch. When we got to the truck (as my other co-worker circled Love Park in fear of a parking citation,) the super friendly staff recognized us–perhaps when my co-worker mentioned it was my birthday–and asked who we were on Twitter. I’m still getting used to introducing myself by my real name and then my Twitter name. It’s funny to meet people in the Twitter world who respond “oh you’re Row Home Eats.” We chatted for a bit before placing our massive order of chicken tacos, black bean tacos, curly fries, the Mighty Moo burger and the Mighty Euro burger. We wanted to try the empanadas but they were all sold out. I’m thinking that it’s a pretty popular item. Because it was our birthday, we got a special dessert on the house! I cannot, for the life of me, remember what exactly my dessert was but it was some sort of blondie with chocolate chunks (or something like that.) It was pretty tasty and I love the packaging! After we placed our order, the owner came out from inside the truck and chatted with us for a bit before introducing us to the friendly city employee who spearheaded the “lunch at LOVE” program, bringing city folks back into the park during the lunch hours with food truck, entertainment and more. Check me out in front of the festive truck. We finally got back to work and got down to business. The curly fries were a great accompaniment to the burgers, although I certainly didn’t need them with my Vetri birthday dinner fast approaching. 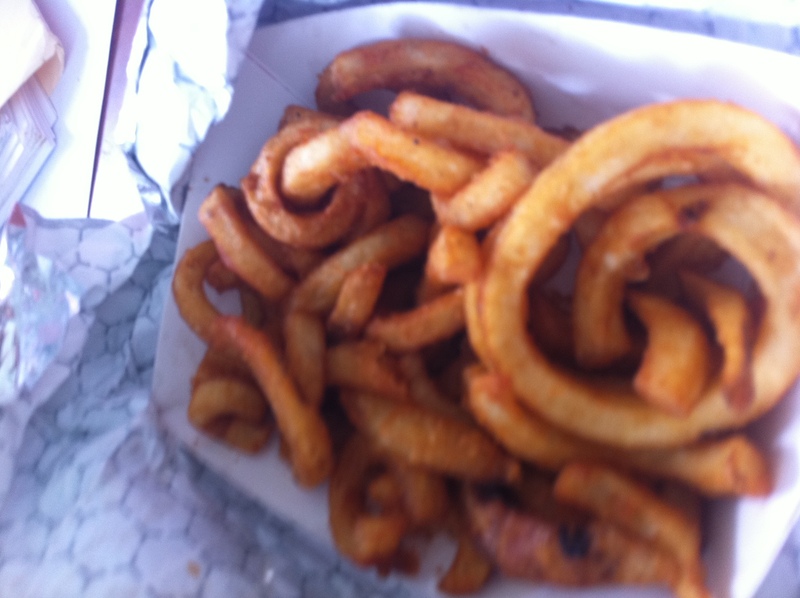 Curly fries are my fave. Next, we opened our burgers. These juicy burgers (yes, I tried my co-worker’s burger too. All in the name of blogging) were just my style. They were cooked on the flattop with a little char ,which provided a nice crunch, and lots and lots of flavor. 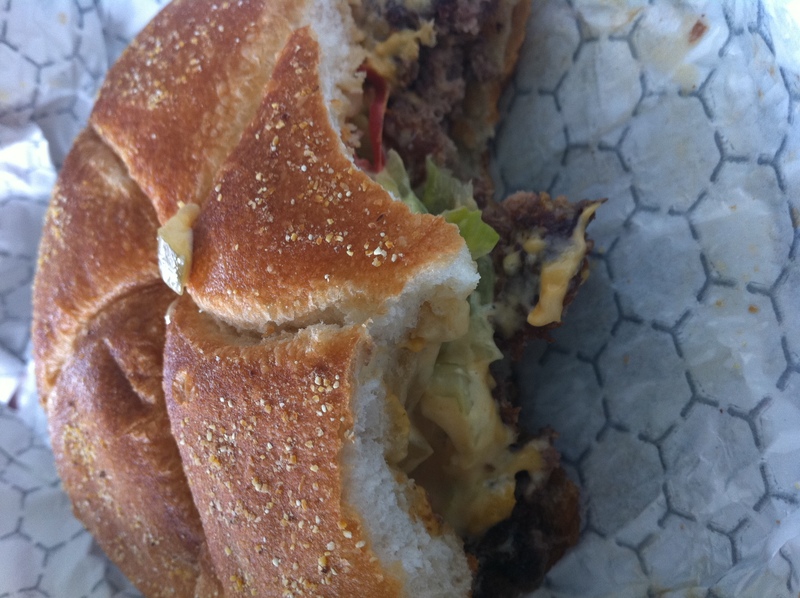 My “Mighty Moo” had the basic toppings–lettuce, tomato, onions, pickles, American cheese and “mighty sauce.” I fluctuate between wanting the simplicity of a burger like this one, with all the “normal” toppings and wanting something a little more far out. I went traditional this time, but my co-worker went all out with the “Mighty Euro” with bleu cheese, crispy bacon, sauteed onions, tomato, pickles and, once again, “mighty sauce.” I actually preferred the Mighty Euro. While the toppings added a ton of flavor, they didn’t overwhelm the patty tucked between the buns. The Mighty Moo from the top. 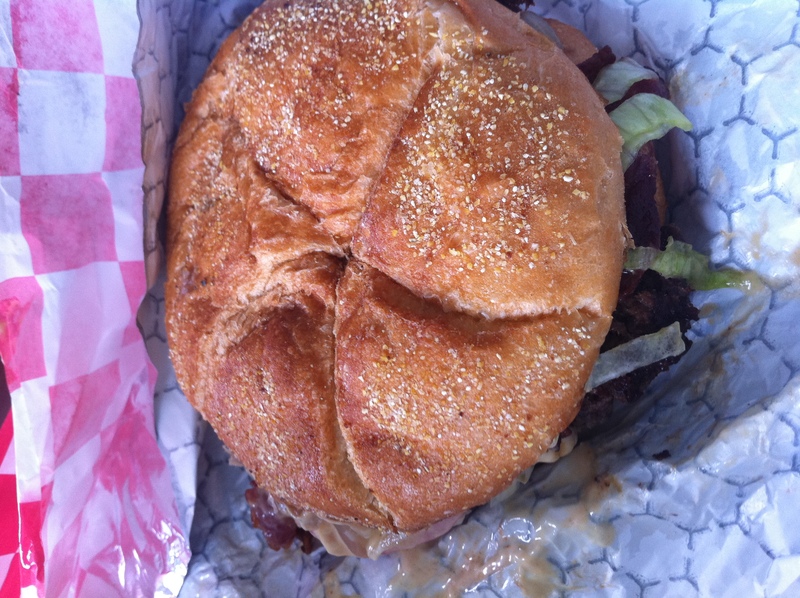 The Mighty Euro–check out those fixins! 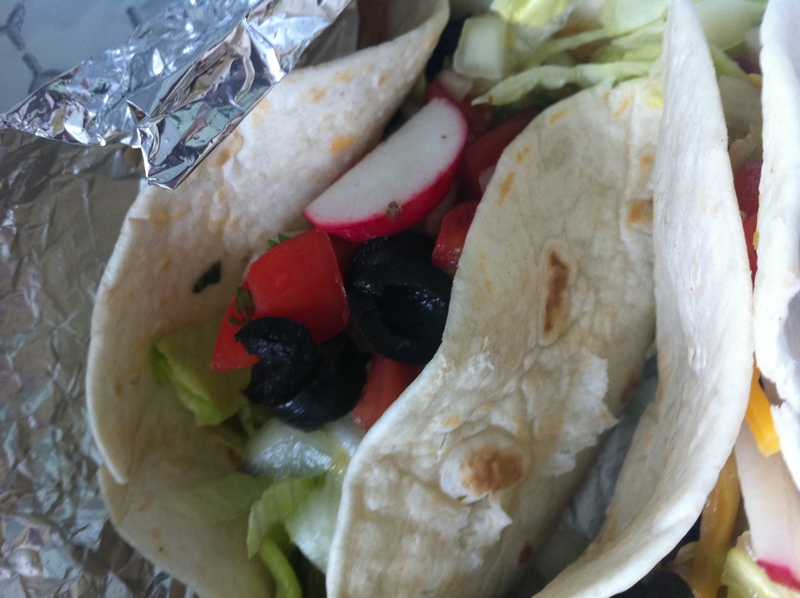 I only tried the black bean tacos and they were light and refreshing. 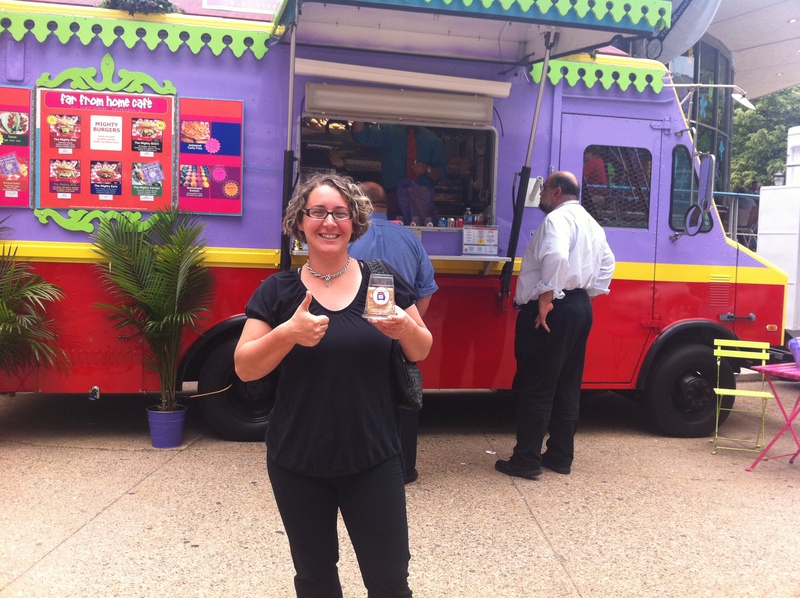 Far From Home Cafe fills a perfect niche in the Philadelphia food truck scene. They’re not trying to do anything spectacular beyond cooking tasty, straightforward food which is welcome in my city any time. I still need to make my way down to Love Park at lunch. A few months ago I stopped by the Buttercream Cupcake Truck. 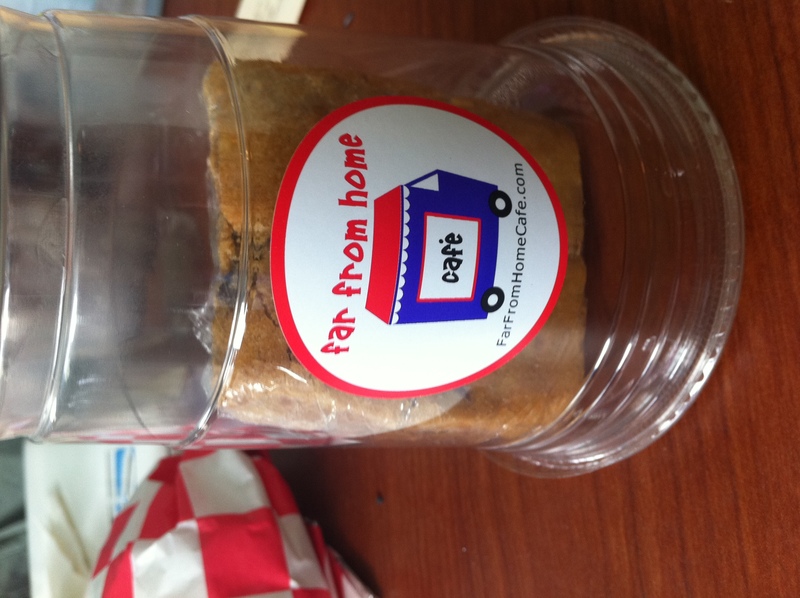 I want to check out Far From Home and Sweet Box Truck (for my Cupcake posts). Shouldn’t the Food Truck be someone’s team mascot? Temple? St. Joe’s. Don’t you see the fit? Sadly, my fears prevented me from patronizing any but coffee trucks when I attended Temple Law School. I packed my lynch every day. I saw the curly fries and HAD to comment on this page.Fries have to be my ultimate favorite food on the planet. The Mighty Euro burger looks extremely well for a burger that came off a food truck and I usually don’t expect food to that great when you order it off of a truck but I actually want to find this truck now. The black bean taco looks like heaven in a tortilla wrap. Just want to let you know that because of these pictures I am currently looking this truck up online so I can make plans to go there. how much are things there?